The Kids on the Block puppets and skits were developed by a private organization in the late 1970s. Junior Leagues throughout the country were among the first to embrace them. Today, Kids on the Block is one of our League’s longest, ongoing outreach projects, impacting the lives of children with each performance. Each year, a troupe of six to eight League members takes the show to elementary schools, local churches and other youth organizations throughout Wake County. Our 45-minute performances include three to four skits, targeted at second-graders. 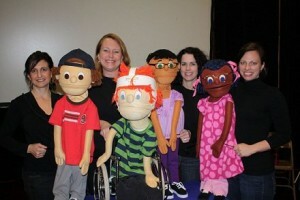 The skits teach children about differences and areas of social concern. They cover topics such as physical and learning disabilities, bullying and healthy eating. Through candid, honest and entertaining dialogue, the puppets educate and inspire children in the audience to ask pertinent and sensitive questions at the end of the skits. The goal is that through education, we can teach children to be more tolerant and understanding of differences. Please contact jlrkotb@gmail.com to schedule a performance for your organization or to obtain more information about our program.